The other day, I stumbled upon a Pantene commercial as I was scrolling through Twitter. At first, I did not understand what was going on because I expected the commercial to solely focus on their hair products. However, what I did not realize was that this commercial was indeed different. It stood out to me. The commercial shows Kevin Balot, Philippines’ first transgender haircare ambassador, caste as the main focus of the commercial. Pantene’s campaign #StrongerNow had launched earlier this year where the movement celebrates resilience and strength in women. This campaign advocates for all women, sharing their struggles and stories to the world. What really made this commercial special was that Pantene took a stand with involving transgender women in their campaign. They weren’t excluded. In the video, Kevin Balot emphasizes that young boys who see themselves as girls do not need to be afraid. Rather, they should embrace it. When they believe that no one understands them, there is someone that always does. In the article, “Beautiful AND Strong: Pantene Starts Its #StrongerNow Movement,” Raine Grey speaks on tiis-ganda culture where Filipinx women undergo various amounts of pain to look beautiful (Grey 2018). Tiis-ganda translates to “for the sake of beauty” where Filipinx women are taught at a young age to look and act a certain way. Pantene’s campaign #StrongerNow deconstructs that culture, allowing Filipinx women to show their scars and pain. Figure 1: Nadine Lustre is currently one of the influential actresses in the Philipines. 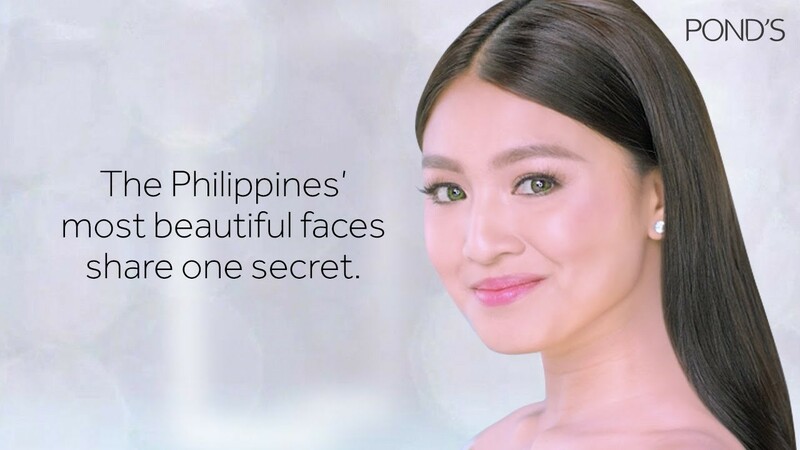 Her Pond’s advertisement sends a message that emphasizes that “lighter skin” is better because it makes you beautiful. Growing up, I was also forced into tiis-ganda culture. My parents have always been strict on what I look like, even up to this very day. There were endless amounts of criticism of my weight and appearance. When I played a sport, they told me my skin was getting too tan. When I didn’t lose weight, they would tell me to stop eating so much as I was about to take the first bite of my meal. They would scold me for accidentally getting cuts or small wounds from falling, saying that it will scar my skin. At some point, I allowed myself to follow tiis-ganda culture to satisfy my parents. I used makeup to cover up my skin, using a lighter shade to represent fair skin. From time to time, I would receive compliments on my makeup. But it wasn’t enough for my parents. “You would look prettier if you lose more weight” was all I kept hearing from my family. It stung. Also, as a Filipinx woman, I find myself stuck with not only my parents’ expectations, but also how Filipinx women are expected to look like in society – fair skin, skinny, long hair, and zero imperfections. But, no matter how many times I force myself to change, I can’t be someone I am not. #StrongerNow acknowledges every Filipinx woman, regardless of age, weight, skin color, etc. I know I can’t ever win against my parents’ expectations of me and I accept that. Watching this commercial has not only made me relive those moments of my childhood, but it also reminded me of how I was able to get to where I am today. In the social media realm, there is a lack of representation of Filipinx women who are not fair-skinned, who do not have long silky hair, and who are thin and flawless. With people like myself who do not fit the strict beauty standards that are enforced on Filipinx women, where does that leave us? Without the media representation of all Filipinx women, we are forced into becoming something we are not. We lose ourselves. We follow society’s ideals of what “true” beauty is supposed to look like for a Filipinx woman. That is why it is so important to include all shapes, sizes, skin colors, and all imperfections of Filipinx women. We may have rounder curves, bulgy waists, darker skin, and imperfections on our bodies, but we are all Filipinx women. Having a truer representation of all Filipinx women gives women the confidence to be themselves and become stronger together. Just as what Kevin Balot says in the film, even though you feel as if no one understands you, there is someone who does understand. Although I may not be skinny, fair-skinned and scar-free, I am a Filipinx woman, regardless of how Filipinx women are represented in society.